Most of us have been taught the heart is constantly responding to “orders” sent by the brain in the form of neural signals. However, the heart actually sends more signals to the brain than the brain sends to the heart! These heart signals have a significant effect on brain function – influencing emotional processing as well as higher cognitive faculties such as attention, clarity and focus, perception, memory, and problem-solving. In other words, not only does the heart respond to the brain, the brain continuously responds to the heart. We know how to create an optimal heart-brain connection on demand, regardless what is going on in your life. The HeartMath® tools allow us to do just that and the results are amazing—for your health, your relationships, life’s work and overall quality of life! HeartMath products, tools and techniques are based on over 25 years of scientific research conducted at the HeartMath Institute on the psychophysiology of stress, emotions, and the interactions between the heart and brain. There are over 300 independent peer-reviewed academic papers published on HeartMath Science. The fact is you can’t eliminate stress from your life. The good news is you can learn how to manage and reverse the damage it can cause and realign with your heart to focus on what matters most to you. My programs and coaching provide simple, practical tools and techniques to reduce your stress, increase your vitality and improve your health and well-being, as you learn to respond to life's challenges positively, regardless of your past and the events themselves. Feel better more often and start living the life you really want! 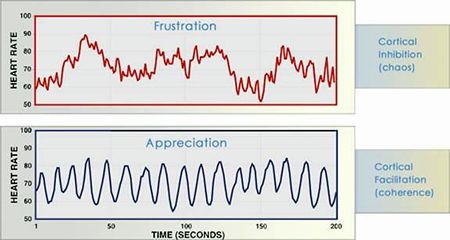 As you shift from feelings like frustration, anger and overwhelm to appreciation, compassion and love, your heart sends a very different signal to your brain. So calm, ease and compassion regardless of circumstances yielding very different outcomes in your life. The HeartMath® tools allow you to do so on demand and create responses and results in sync with your core values, goals and desired outcomes.